The Phoenix City Council in June approved $70,000 in Historic Preservation Exterior Rehabilitation grants to repair a well-known historic mansion near Encanto Park. 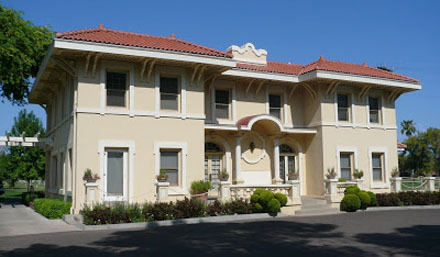 The Norton House, originally built in 1912 by Dr. James C. Norton, has served as an office for the Phoenix Parks and Recreation Department since the 1950s. A historic preservation grant for $70,000, with matching city funds of an additional $70,000, will be used to restore part of the exterior wood elements (submitted photo). The Planning and Development’s Historic Preservation Office received a grant request from the Parks and Recreation Department in May for the Dr. James C. Norton House, located at 2700 N. 15th Ave. The city has also identified $70,000 in Parks and Preserves Initiative funds to match that $70,000. The $140,000 will be used to restore the original double hung and casement windows and any other wood elements like lattice and trim. Norton, who was originally from Ames, Iowa, served as a territorial veterinarian from 1893 to 1912 and later established the Norton Dairy on a section of land extending from present day Encanto Boulevard to Thomas Road, between 15th and 19th avenues. The land was eventually sold and became part of Encanto Park and Golf Course. The Phoenix Parks and Recreation Department converted the house and uses it as an office today. The house is significant for its Mission Revival-style architecture. It was listed on the Phoenix Historic Property Register in April 1989 and listed on the National Register of Historic Places in November 2017.